Salmonberry bushes on Calvert Island at various stages of development. Photos by, clockwise from top left: Kelly Fretwell (left and right), Sienna Hamilton, Yuhei Iida, and Georgia Brander. Salmonberry is an erect, deciduous shrub. It grows to 4 m tall and branches often, so that it tends to form thickets. It is less prickly than some other Rubus species: the prickles are generally smaller and less frequent. 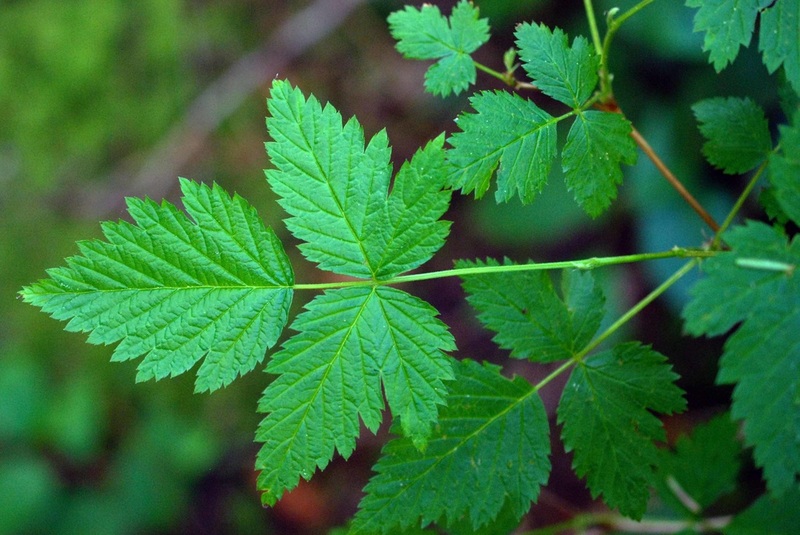 The leaves alternate, are dark green, and are composed of three sharply-toothed leaflets. Together the leaflets form an elongated maple leaf-like shape. 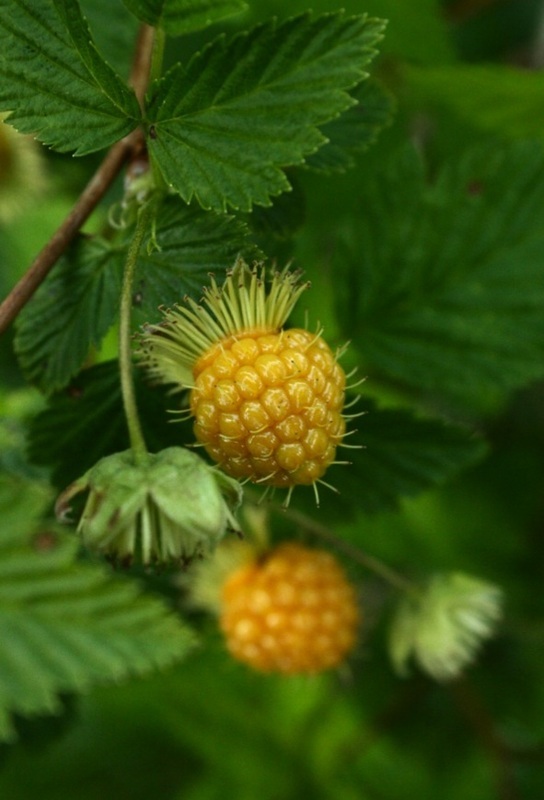 The berries, which ripen in May and June, look like shiny yellow, salmon-coloured, or orangey-red raspberries. 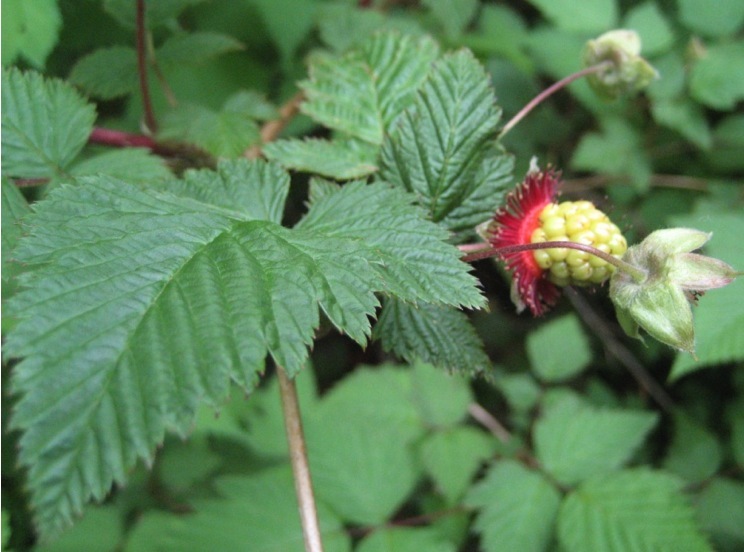 Salmonberry grows in both shaded and unshaded areas with moist or wet soil. It often grows in the understory of moist forests, along streambanks and swamps, and around disturbed sites such as trails and avalanche tracks. It can be found from low to subalpine elevations all along the west coast, from Alaska to California. It is a common species in BC. Salmonberry could be confused with other Rubus species (black raspberry, thimbleberry) if if one is unfamiliar with these plants. Generally both the leaf shape and the berries make it a fairly recognizable species, however, and it quickly becomes familiar and easy to identify. The berries are edible, and while some people say they are delicious, others find them unpalatable. They are a traditional coastal First Nation food, and were sometimes eaten with dried salmon eggs or oolichan grease . Stem sprouts were also a traditional food - they were peeled and eaten raw or steamed. These sprouts were treated as a vegetable, and were gathered in spring and summer. 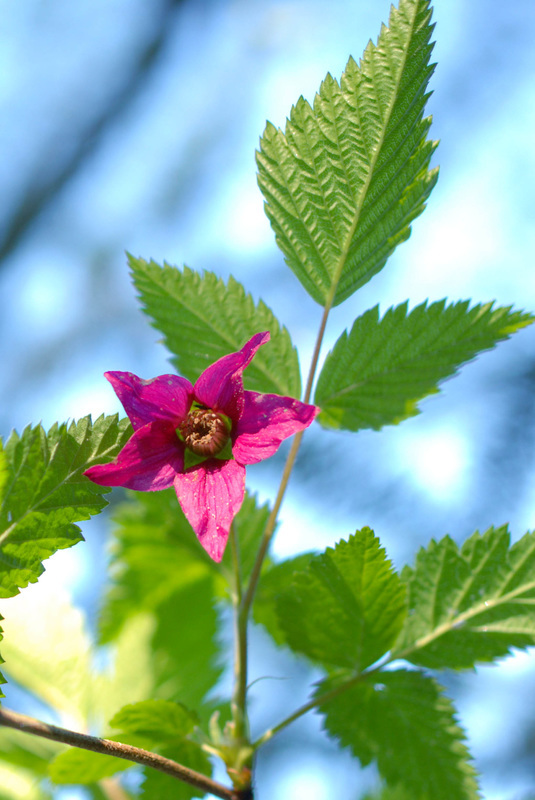 Tips for salmonberry picking from Pojar and MacKinnon: The taste of salmonberries can vary even within a single clone, and these clones can be extensive, so scout out all the salmonberry bushes in the area instead of focusing on one area. 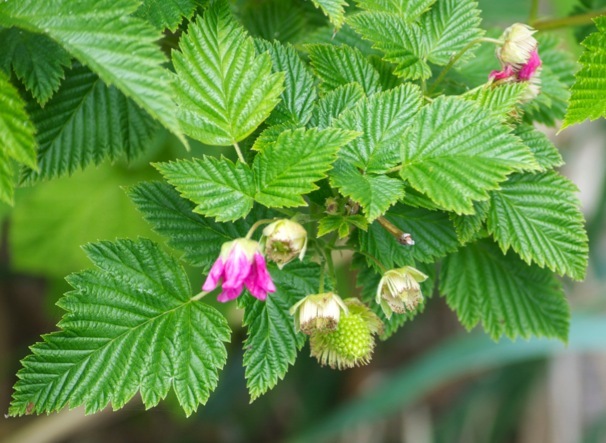 Salmonberries are fairly fragile and get mushed easily, so it's best not to pick after heavy rains, and to fill containers with salmonberries no more than 5 cm deep. The May/June ripening of salmonberries is associated with the distinctive song of the 'salmonberry bird' - the Swainson's thrush. Pojar, J. and MacKinnon, A. (1994). Plants of Coastal British Columbia. Vancouver, BC: Lone Pine Publishing. P. 76. Rubus spectabilis Pursh. In Klinkenberg, Brian. (Ed.). E-Flora BC: Electronic Atlas of the Plants of British Columbia. Lab for Advanced Spatial Analysis, Department of Geography, University of British Columbia, Vancouver. Accessed 21/08/2013.